It used to be that I would buy buttermilk for a recipe and 3 months later find the container curdling in the back of the refrigerator. No more! Do you know that buttermilk can be frozen? 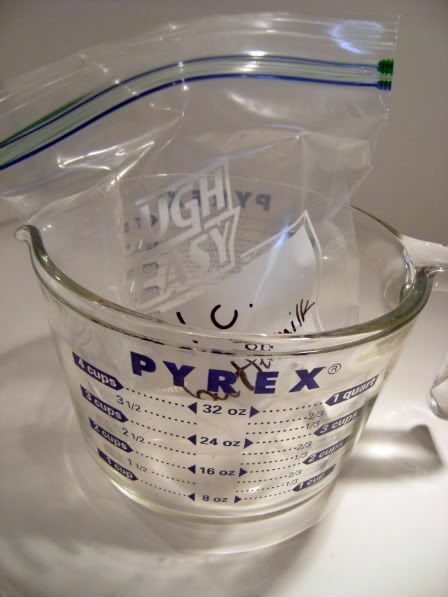 Put a freezer baggie in a large measuring cup so it doesn't fall over. 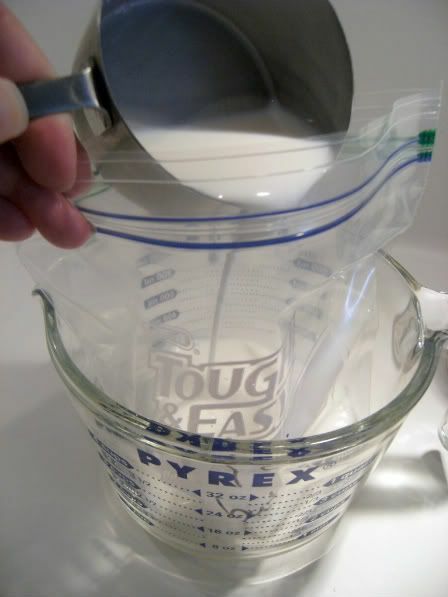 Add 1 cup of buttermilk per bag and freeze. To thaw, place in the refrigerator overnight (if you're thinking ahead), or place in a bowl of water in the fridge, or under running water, and "massage" it every so often (the quick way). NEXT WEEK....a recipe to go along with that buttermilk. Great idea! I always find bad, old buttermilk in my fridge, so this will help me quite a bit! This is an AWESOME tip! I just made a triple batch of waffles today so my buttermilk wouldn't spoil. I freeze buttermilk too it works great. Awesome! I never thought of this...so many gallons of buttermilk that I've curdled over the years. Do you know the limitation? How long can you freeze it and still use it? I'm thinking a date on that baggie might be a good idea, too. I freeze buttercream icing, too. And boy! does it come in handy. Great idea. I wish milk could be frozen too. Who knew buttermilk could be frozen??? I'd switched to powdered buttermilk for many baking uses because I hate the waste of buying a quart of buttermilk, using two cups, and eventually throwing out the rest. Bridget....you are never going to believe this. I discussed this exact same idea yesterday afternoon with a coworker. I just made those coconut cupcakes which required buttermilk and figured the rest of the milk would end up going bad (like the last recipe I made that required buttermilk). We both wondered if you could freeze buttermilk and you answered our question. Thank you!!!! THANK YOU!! I have never even considered freezing it...I buy it for chocolate cupcakes and ALWAYS find it later in the back of the fridge. Great tip! You are such a smart cookie :) Thanks for the tip! Awesome tip! I had no idea. Now that's a GREAT idea! I stopped buying buttermilk for just that reason! Thanks for sharing! I usually didn't buy buttermilk and would make my own with milk and lemon juice, which just isn't quite the same, for the very reason that it would spoil or it didn't all get used. I had no idea you could freeze it. Thanks for this tip!!! This is a terrific idea. So often a recipe calls for a cup of buttermilk, and I have no use for the rest of the quart. Thank you! I freeze it in 1/2 cup amounts for cornbread...sometimes I'll use a muffin tin. This time I grabbed some of the plastic cups that hubby used to start seeds in. I need to grab them out of the deep freeze, dip the bottoms in hot water and slide them into a ziplock bag. I also did this when I used the muffin tin. Dipped it in hot water and slid them out. I remember when I learned about freezing buttermilk - but I love your cup rations - that is so smart. You know, I never thought to freeze buttermilk... and I always end up throwing away half-empty containers because it has spoiled. Thanks for the great tip!! Oh this is a wonderful tip. I can't tell you how often I've avoided buttermilk recipes because it always seems to go bad in my fridge. 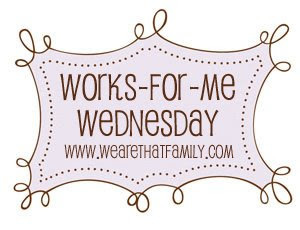 Please, Please, next week link it up at Tammy's Recipes for Kitchen Tip Tuesday. They'll love this over there. That is a great tip. I'm always trying to think of ways to use it up--- or more likely, finding it curdling after 3 months at the back of my fridge. Great tip. Now I won't be afraid to buy that extra quart when it's on sale. This NEVER occurred to me and I never really liked using powdered buttermilk...i will freeze from now on! This is the greatest tip ever! I threw away a carton of buttermilk yesterday. I'm so happy you can freeze it! This is a GREAT hint! I too often have spoiled buttermilk because I only use it in handful of recipes. I love this tip so I don't have to waste it! Awesome! 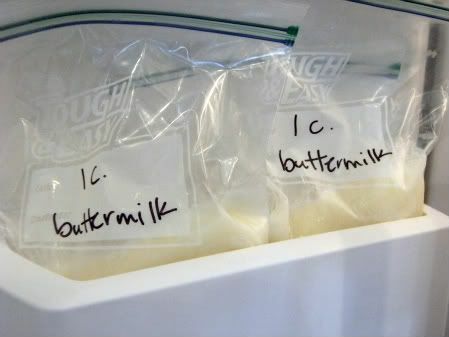 I have some recipes that call for Buttermilk but i don't use it enough to actually to go through a cartan buttermilk. Knowing now that i can freeze it, will be so much better! this is in fact wonderful. However, when I thawed my last batch, it was separated into an almost clear liquid and then floating chunks. I assume this means the buttermilk went bad, but why? I filled 1 cup ziplock containers, froze the buttermilk, dumped the frozen 1 cup shapes into a freezer bag to get my containers back.